Salads are not my forté. I realize their potential, and creative additions often occur to me (cubes of cold frittata! soft goat cheese rolled in ground spiced nuts! ), but I’m not great at building one, unless it’s the grainy, beany kind. Not that there’s anything wrong with that. But my greens – they’re growing! I need to keep up. I’ve recently discovered the appeal of the plated salad – perfect for just three, and just as perfect for more – you start with a long plate or small platter, make a nest of greens and layer interesting things on top. I always wind up with too much when I fill a salad bowl, and this way the greens are there, but don’t take over the party. I have the BBC to thank for this one, although I did make some changes – I like roasting potatoes rather than boiling them (you don’t lose nutrients to the water that way), and I swapped the pine nuts (which have you noticed are more expensive than platinum?) for toasted pecans. Walnuts would do nicely, too. 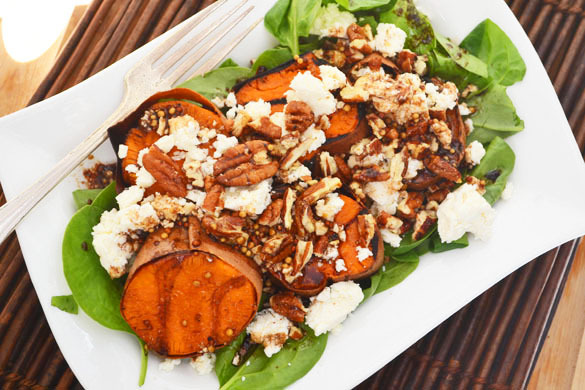 Charring sweet potatoes is brilliant – it transforms them into something more smoky and intense – and you can go ahead and grill them alongside your steaks or whatever you have going, although this salad makes a pretty spanking dinner all by itself. Looks great! I feel like those flavors go really well together; I don’t think I’ve had sweet potato on a salad yet. Tip on pine nuts — I’ve noticed at Costco pine nuts are cheaper than pecans! That looks delicious! I’d never have thought of grilling sweet potato. I concur with Carolyn, pine nuts are reasonable at Costco. I keep the bag in my freezer and toast them as I need them. 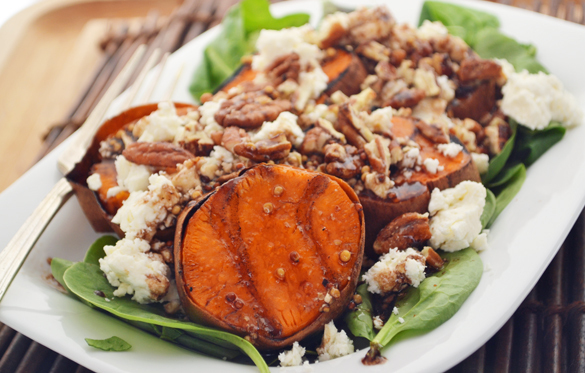 I just adore the sweet potato/ feta combo. This looks great. ohhhh love this…the perfect combination of some of my favourites…and the colours! Brilliant. Spontaneously thinking a turn or two of coarse black pepper would finish it off. Thanks, Julie, you’ve given me dinner tonight. Made this for dinner last night. I only had goat cheese and it was fantastic! Love your site! I made this last night with goat cheese….FANTASTIC!